Posted 15 July 2013 by Tom Watson & filed under Articles, Design. When you’ve had a long day at work, you’re out for a meal, or you’re having a discussion group, you definitely want to make sure you have a comfy seat to sit on. But not only do you want it to be comfortable and stylish, being perfectly suited to your home or business is also a priority. There is a large variety of great seating choices that can really help maximise all of the space in your rooms, as well as matching the décor and style perfectly. Below is a guide to some inspirational seating solutions that you might want to consider. Modular seating works very well in big communal lounges such as in a college, university or even in a large home. The seating is available in a variety of colours, so you can choose one that will complement your room’s current décor. 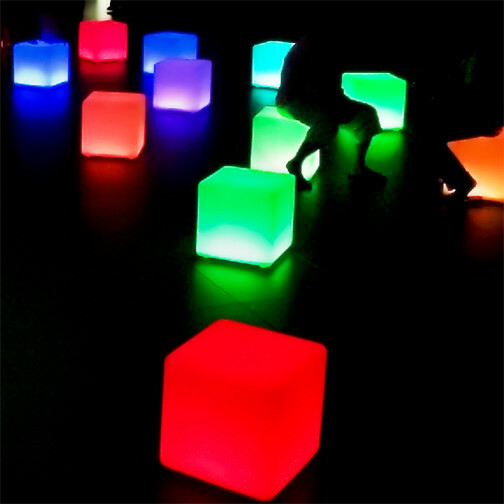 Cube seating is another fantastic and inspirational seating solution. As these seats are literally cube shaped, they do not have a back and therefore take up less room than a normal chair. They are very easy to store, and can be tucked underneath most dining tables quite easily or even stacked! Although you may not want these as you primary source of seating in a home, they are extremely good to have as a back-up for when guests come round. In a larger business or university context the cube seating is very versatile and, as a result, a great asset to have. They are very easy to move around and can be great for seating during discussion groups, meetings or more informally while watching a film. Another great form of seating is a bench. These are particularly good as they do not offer a set amount of seats, so you can squeeze on as many or as few people on as you like. Benches can come with a back to lean against or without; without they are just like extended cube seating. Benches can be purchased in a variety of different sizes and colours, so you can choose one that will suit your location perfectly. Whatever the need, benches are versatile and fantastically inspirational seating solutions. If you are looking for seating that can remain in the same place, then fixed seating is a great option. You can get a variety of different styles of fixed seating, so whether you’re looking for a stylish seating solution for a restaurant, or a relaxed seating solution for a university common room, fixed seating is a great option. Fixed modules ensures that the seating cannot be moved and therefore the set-up of the room must remain exactly how you want it. It also means that people can completely relax, as fixed seating feels a lot more secure than any other type. Although this might seem like quite a straightforward seating solution, chairs can also be quite innovative. Chairs can be made in a large variety of materials, such as plastic or wood, and are usually quite easy to move around. That sort of versatility can be very useful when you’re looking for a flexible seating solution. You can also get chairs at a variety of different heights. For example, if you have a bar and therefore need taller seating, you can invest in bar stools, or chairs that have longer legs. On the other hand, you could also buy simple, yet modern, chairs to go around your kitchen table… there are so many options! These 5 fantastic and inspirational solutions will definitely get you thinking outside of the box when it comes to seating. There are so many options that you might find yourself spoilt for choice!